In 2006, the police suspected Kefyalew Teferaa of being part of an outlawed group. When arrested, he was shot in the legs, causing a lifelong disability. Jailed for 12 years and exposed to constant torture in prison, Kefyalew’s life would never be the same. In September 2006* Kefyalew was heading to Addis Abeba, the capital of Ethiopia, with his friends, when the police started to shoot at them. Kefyalew got wounded in the knee of one leg and the thigh of his other leg. He was then directly taken to the Police Hospital, where both his legs were amputated. Kefyalew says this was done without his knowledge or consent, while he was under anesthesia. 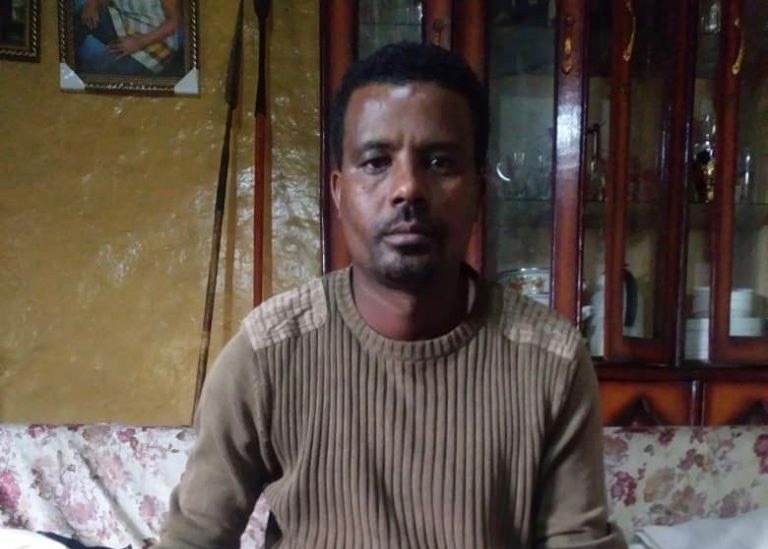 The police later detained Kefyalew, because they suspected him of being a member of a criminal group called OLF (Oromo Liberation Front). Before Kefyalew’s wounds could heal properly, he was moved to the infamous Federal Police Investigation Center. “The first person who interrogated me was the commissioner. After asking me a few questions, he told his comrades to ‘help me take a shower’. I understood that he meant ‘beat him’. They tortured me immediately after he left,” Kefyalew says. The interrogators used to come drunk at night and beat Kefyalew. This continued for seven months. In addition to the torture he also endured their daily insults, intimidation and threats. “Sometimes at night, they took me to unknown places and threatened to kill me. And they didn’t allow me access to medical help, even though I needed it,” he says. Kefyalew was taken to court seven months after his detention. This was the first time he changed cloths in months. He was not allowed to have visits from his lawyers or family. After this, Kefyalew was transferred to two different jails. Neither experience was good. “I was disabled and no one was there to help me to the toilet,” Kefyalew says of his experience in one prison, “My body was injured, so it was challenging in every prison I was moved to,” he says. Kefyalew was a third-year student in Hawassa University when he was arrested. Now, his life is forever changed. He has not received any compensation for the atrocities that has been done towards him by government officials and no one has been held accountable. “Now, I’m assisted by artificial legs. But the material of the artificial legs has limitations. It doesn’t give me comfort. It pains me,” says Kefyalew, who finds life after prison being very tough. This article is part of a series of stories that highlight the human rights situation in closed institutions in Ethiopia and Uganda. It is written by Civil Rights Defenders’ partner organisation Ethiopia Human Rights Project, and supported by The Swedish Institute’s Creative Force project. *Since April 2018, Ethiopia has been undergoing a tumultuous political change. Similar stories documented and reported under this project occurred before this transition. Promising changes are also currently implemented in prison administrations and how prisoners are treated. Allegations of torture – and other violations in prisons, locked institutions and police detention centers – are therefore highly reduced.